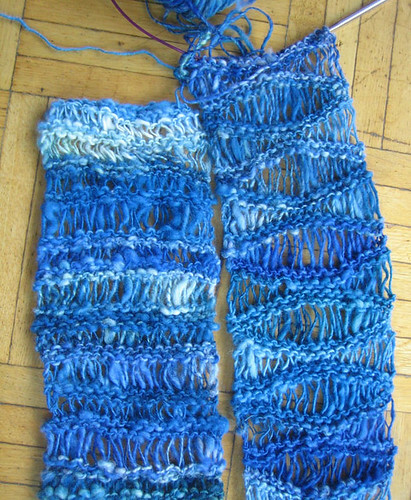 This is a little scarf that I’m working on with the yarn I hand spun from hand-dyed polwarth roving [see dyeing in previous post here]. It is a very satisfying little project, perfect for the bus and skytrain, and yes, nerdiness abounds, I’ve even begun to knit while walking, I’m embarrassed to admit. It’s just such a great way to relax after a hard day of work! Wow, looks very nice! 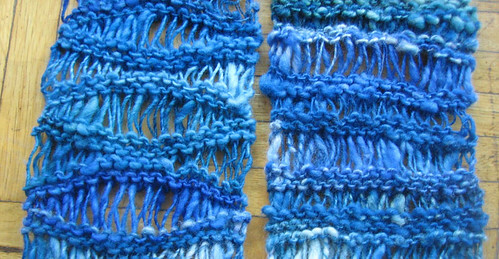 Congrats on the handspun and handdyed yarn, you must be proud. Thanks for the great pattern! I’m new to knitting and am always on the lookout for projects to try. I wanted to pass along a website I found that has a few basic how to videos with tips on knitting. I’m not sure if you’re interested in how to knit videos, but I found these useful when I was just starting out.